Annemarie Ryu '13 (from left) a pre-med anthropology concentrator and veteran Harvard public service traveler, has started Global Village Fruits, a for-profit social enterprise she hopes will connect jackfruit farmers in southern India with American consumers. Here, she is seen with co-researchers Kara Kubaryeh '13 and Devon Williams '11 during a study inside the Greenhouse Cafe. Last summer, on her first day in Bangalore, India, Annemarie Ryu ’13 fell in love. The object of her rapt attention was green, spiky, and the size of a beach ball. What Ryu fell for was jackfruit. Her first taste of the vitamin-rich food was from a sidewalk vendor: a handful of slippery yellow slices, served up on a sheet of newspaper. That magical feeling about Artocarpus heterophyllus could soon be yours. Ryu, a pre-med anthropology concentrator and veteran Harvard public service traveler, has started Global Village Fruits, a for-profit social enterprise she hopes will connect farmers in southern India with American consumers. It’s about time America woke up to jackfruit, said Ryu. The oval tree fruit has long been a common food in South Asia, Southeast Asia, the Philippines, East Africa, and Brazil. It is variously known as jak, jaca, mak mi, and mit. It’s the national fruit of Bangladesh. But the West has not caught on, to the wonderment of some experts even long ago. In 1928, America botanist O.W. Barrett, once a specimen collector for Harvard, remarked on the fruit whose trees are “so well-behaved that it is difficult to explain the general lack of knowledge concerning them.” In the 19th century, jackfruit cultivation had made modest inroads into Florida, but never caught on with growers. Jackfruit has a robust nutritional profile, said Ryu, who plans a career in public health and international medicine. It’s high in fiber, beta-carotene, and manganese, as well as being “antioxidant, anti-inflammatory, antibacterial” — whew! — “anticarcinogenic, anti-fungal, antineoplastic,” and more. Dried into snack strips, jackfruit tastes like mango, though it is more subtly sweet. 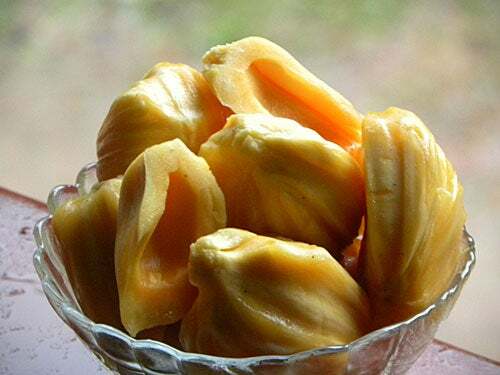 Jackfruit seeds (there are up to 500 in a single fruit) can be made into flour that is gluten-free, high in protein, and rich in vitamins B1 and B6. Its interior bulbs can be ground into a flavorful powder, ready for blending into baked goods, smoothies, ice cream, and bubble tea. Ryu hopes products like these will spur an American jackfruit market. For now, shipping the fresh fruit from India is not likely because of federal regulations, she said. 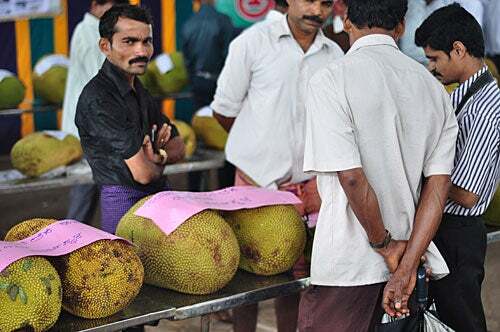 But jackfruit in its dried forms can be imported with little red tape. Jackfruit, the product of stately trees up to 60 feet high, can grow to the size of a pumpkin, 80 pounds in weight and 3 feet wide. Ryu stretches out her arms to show how big. Her jackfruit inspiration sprouted after a fervent series of international public service trips starting in freshman year. Ryu, who just turned 21, has delivered water chlorination units to the Dominican Republic and built latrines in Haiti. She has conducted health research in Nicaragua and India. She also traveled to Cuba last year as a violinist with the Harvard-Radcliffe Orchestra. “If we’re going to get out of what has been a very tough period, it is going to be because both countries decide they’re going to look at something bigger than themselves,” said U.S. Ambassador to Pakistan Cameron Munter at a Harvard Kennedy School talk on Monday.